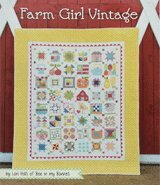 How do you square up a quilt before adding batting and backing? I am doing a Disappearing Nine Patch and it's not as easy as I expected. First I must apologize for taking so long to respond to your question. There was a problem with my hosting company and a large number of older questions appeared in my dashboard recently. Yours was one of them. Again, I am sorry for my tardiness in answering. 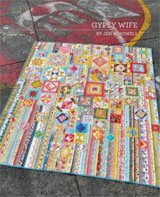 When I first started quilting and squaring up my quilts in preparation for sandwiching, there were a couple that I truly slaughtered. In using a ruler and rotary cutter to square them up, the corners were, indeed, at right angles...but visually the result looked off. Only one of them has ever seen the light of day. As time went on and I made more quilts, I came to the realization (sometimes I can be slow) that the quarter inch seam allowance is crucial to having square blocks. And if the 'units' that make up a block are off, the block will be off...there's just no getting around that. 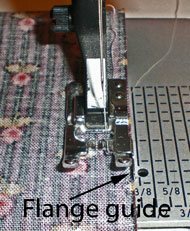 Use a piecing foot with a guide. This little foot is my lifesaver. There are so many times when I'm quilting that I'm not at my best...like there's a quick 15 minutes to sew while dinner's cooking, waiting for the call to go pick up my kids, or it's at the end of the day. My eyes are tired, my body's tired, and my powers of concentration have evaporated. That little guide does the trick in making me look like I know how to piece regardless of if I'm really brain-dead. Paper piece units whenever possible. 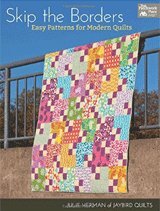 I have Electric Quilt software and use it...a lot. Going back to having the units in a block measure up...when there's lot of something...I know I'm going to have some brain farts while I'm working...my mind just drifts off. But I can reliably sew on a line. So I create paper piecing units when I can. Yes! You've got to tear the paper off...but I save that for TV or appointments and it's pretty painless. The result of these three 'tricks' is that my blocks are usually so close to accurate that there's no real need to square them up. If the blocks are square, the quilt will be just as square. So how do I know if the quilt is square? For a down and dirty check without a measuring tape, I fold the quilt in half lengthwise to match the ends, and then crosswise and match the ends. If they match both times...it's square...enough. Did something shift when I joined the quilt blocks together? Did I press a tuck into the seam allowances? If so, I fix it, then and there, because that is the only possible culprit if the blocks were square to start with. 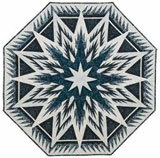 Another way to see if your quilt is square is to fold the side edges into the center and compare. If the edges are within a 1/4" of each other and the center, you're pretty much good to go. Repeat with the top and bottom edges folded into the center. If there is more than 1/4" disparity, check the seam allowances you used joining the rows or columns together. It's easy to 'misfeed' the ends as you are sewing...using a stiletto or bamboo scewer can help to feed patches straight into your machine. If you're folding the sides into the center and the sides (or top and bottom edges) are shorter than the center, it's a good bet that the seam allowances were bigger at the beginning or end of a seamline. Correct any seam allowances that are off. Check again by folding the edges into the centers. If you still have a significant difference in the measurements, you'll need to go back and evaluate the indiviual blocks. To square the corners, grab your large square rotary ruler. 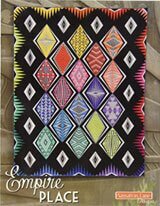 I look for a seam line that was used to join a row or column of blocks to a border strip...because I know it is straight. Then go back to your pattern to confirm how far it should be to the edge and measure. If I have to do more than just tidy up the edges (just a slight haircut), I go back to the quilt to see where my seam allowances are off. I am pretty persnickety when it comes to the measurements on my quilts...that's how I'm built. And I find satisfaction in challenging myself to strive for perfection. But we're different people. And what you get or need from quilting is probably different. That's terrific! It's how it should be! So if it's a quilt that's going to be tugged and tussled and totally cuddled with...done is better than perfect everytime. Do the best you can and need to do, but then finish it and move on to the next one. I hope this has answered your question. Again, I apologize for the lateness of my response. Readers, how do you square up your quilts? Do they have to be 'perfectly' square or is 'finished' better than 'perfect'. Do share your thoughts with our readers via the link below. Thank you! Hello to all. I am new to here, and quilting. I was away at our winter house, and my husband left most of his tools home. (at our summer house,) I was trying to get 2 quilts done before Christmas, and October was beaming down on me fast. I am not good at it yet, and make many mistakes,, but so far, my grandkids love their quilts, (with secret pockets, and messages written on both sides, with craft markers. Well here in Az. I have to square a quilt with no square to work with. My husband thought for a minute, then brought in to my sewing room a new piece of tile that he was going to use in his man cave, I think it was a very brilliant idea . After all square is square, right? From the Editor: Love your story, Chris! Neccessity truly is the Mother of Invention. I use a roofing square and I make a cardboard form each time and this works fine. I must say though that I have made a couple of quilts in the past and after measuring all the pieces originally I never measured again. These quilts have now been in use for many years and no one is complaining that I never squared up the blocks. I guess I must be the done is better than perfect but I didn't know it. I do 1/4" seams and press (I think pressing is important). I have a long dry wall square (about 5ft long) and so far my quilts have square enough for me. Every quilter has to march to their owner drummer. Quilting should be enjoyable not a chore. Sewing is not my strong suit, but I love making quilts. Getting 1/4" seam I don't hit all the time, but my quilts are to be cuddled and loved and I do the best I can and none of my kids have complained LOL.